A progress bar on the weekly multimedia commentary page of 4 October 2005 on the Volkskrant website het Oog [the Eye], says 'the commentary on your current affairs is being loaded'. It's taking a while, so in the meantime I have a look at Martijn Engelbregt's site – he produced the present instalment. As Engelbregt Gegevens Beheer Groep [egbg, Engelbregt Data Management Group] he has been providing a viciously ironic commentary on our culture's obsession with facts, data and statistics for years. Sometimes to the point of cynicism, as in the much discussed research into illegal immigrants in Amsterdam, carried out in 2003. Under the official sounding name 'Regoned' (an acronym for Netherlands Registration Organization), egbg arranged to have more than 200,000 forms sent round the capital asking about such things as the legal (or illegal) status of the person completing the form and whether he or she would be prepared to report any illegal immigrants known to him or her. In my view, the project was a patently obvious and biting commentary on the Verdonkian obsession with rounding up and doing away with actual or possible non-Dutchmen, but many people allowed themselves to be provoked by Engelbregt's practical joke. His key question 'Are you willing to report these actual or possible illegal immigrants?' was implicitly asking 'whether the person completing the form was prepared to cooperate with the execution of government policy'. In this way 'what was often tacit approval . .. was turned into a question about actively contributing to this policy'. The difference between this and the officially proposed telephone number for reporting benefit fraud was marginal, but the 'emotional difference' turned out to be enormous. The press hyped 'Hunt for illegal immigrants as a Work of Art'; Engelbregt was dubbed a Nazi, and worse. All this in no way prevented the government from inviting Engelbrecht to make a proposal under the percentage rule (a percentage of the building sum is reserved for art) for the rebuilding of the old Logement van de Heeren van Amsterdam in The Hague into an annex to the Lower House. Engelbregt set up De Dienst to look into the relationship between art and democracy and to put the available 160,000 euros – roughly one cent for each resident of the Netherlands – under the complete control of every citizen. One of the things that De Dienst did was to use a website to organize a competition for art for the new building; 522 entries were submitted. These were judged, fully in accordance with normal procedures, by a variety of committees and experts, and finally a selection of nine works was chosen to be realized in or around the Logement. The fact that one of the nine 'democratically selected' works happened to be by Engelbregt himself provided material for criticism and debate ('a put-up job! '), even involving questions in the House, but in any case Engelbregt was finally able to convince his clients that everything had been done with 'total transparency'. Thus at the beginning of this year the four-year project reached its festive conclusion with the unveiling of the nine works of art and the presentation of a book in which the whole process was described in the finest possible detail. The Dienstcatalogus, though somewhat chaotically designed, is a treasury of data and information. As a reverberation of all the correspondence, consultation, papers, recommendations, meetings, parliamentary questions, press reports, reviews, discussions, e-mails and so on, it is unsurpassed. It contains illustrations and discussions of all 522 works of art and, if I may say so, gives a rather humiliating picture of the popular view of contemporary artistic ­ production. In one of the accompanying essays, art historian Brigitte van der Sande writes: 'The end result of Engelbregt's Dienst research yielded terrible art, often no more than a frivolous idea. . .. Must we conclude, then, that art chosen by democratic methods can never ever be sparkling, provocative, unexpected or innovative? I'm afraid we must.' I support this view, except for the qualification 'provocative'; the majority of the entries were deliberately provocative, varying from the up-thrust middle finger (a gigantic limp prick as a sculpture for the Binnenhof) to the instructive insult (Why don't you listen for once!). The project convincingly demonstrated that if you ask the public 'what kind of art would you want our representatives to be confronted with, day by day', it turns out that the public is more interested in confrontation than in art. The pictorial result of egbg's research may perhaps not be good art, but it is certainly a telling illustration to accompany the Fortuynesque analysis that the public feels that its voice is not heard. But what about Martijn Engelbregt himself? Is he a good artist? Is his Dienst a good piece of art in public space? And is the Dienstcatalogus a good book? I am prepared to say: yes. Engelbregt has turned the area of tension between (cultural) data and its (culturally determined) interpretation into material for his work, and uses it to make what are sometimes corny, but much more often highly acute 'portraits' of the way we see ourselves. As an artist he stands at the centre of public debate, not only about art, but about everything that touches us deeply, and enters into discussion with public opinion. Nor does he simply reproduce it – egbg's filtering of data, and the well-nigh Machiavellian pleasure with which he edits the questions which generate these data, complicate the apparently democratic content of his projects and allow his own voice – that of an artist / designer with an opinion of his own – to be heard in full detail. However much the idea may have been to let 'the voice of the people' be heard, egbg manipulates not only what that voice says, but also how the results of his surveys are interpreted, with his combinations of data, the design of his lists of questions and data (labyrinthine, viciously circular) and his typography and presentation (apparently simple, sometimes to the point of awkwardness, but well structured and consistently designed). 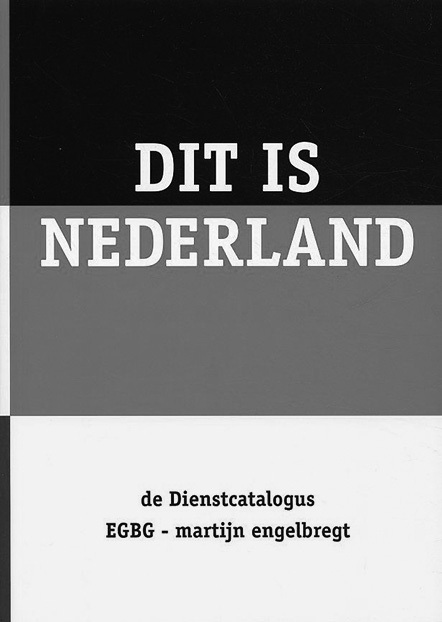 The cover of the Dienstcatalogus is a case in point: the main colours are those of the Federal Republic of Germany (black, red and yellow), while the Dutch tricolour is limited to the margin and the spine. Because Engelbregt is crazy about data, I have to assume that this division has some significance. Is it a matter of comparative scale, as measured by population, area or gdp? However that may be, the colouring forces one to face the fact that politically and economically the Netherlands can be considered a marginal part of Germany and that therefore 16 million Dutchmen would be advised not to be too arrogant. Which is something that they certainly are in this book, so the attempt to put things into perspective is by no means superfluous. Meanwhile, the progress bar on the Volkskrant website continues to read: 'the commentary on your current affairs is being loaded'. It looks as if it will go on for ever and we will never know the result in full. In its simplicity, the work reminds me of a saying by Montaigne: 'Who would deny that commentary only increases uncertainty and ignorance?... The hundredth commentator passes on the book to his successor with even more complications than had already been found by the first.' Like Montaigne, Engelbregt cannot leave things alone. Max Bruinsma is a freelance design and art critic, curator and editorial designer. He is the former editor of Items design magazine and of Eye, The International Review of Graphic Design in London. Bruinsma has lectured on contemporary visual culture, graphic and media design throughout the world. In 2005, he received the Pierre Bayle Prize for Design Criticism.